Outside of a Blog: Miracle Morning? Yes, Please! I followed the link to find out more about this Level 10 Life, then I read about Hal Elrod's book, The Miracle Morning. I couldn't download that puppy to my Kindle fast enough! C'mon, who doesn't want miracle mornings...or miracle anythings, for that matter. I knew this would be just what I needed, since I had fallen into a funk of sleeping as late as I pleased and lumping around for hours too many mornings to count. I had been telling myself that I deserved it, now that I'm retired. I spent plenty of mornings rising early and hitting the ground running. I have earned my lazy mornings. But my heart wasn't buying it. After all, I'm retired, not dead. Hal tells his own amazing story in the introduction, so be sure not to skip that part. Learning about Hal will help you to understand how the idea of the Miracle Morning came about. There are three main learnings that I got from this book. A five-step plan for really waking up in the morning. The LifeSAVERS that make the morning miracle. SAVERS is an acronym for the components that make up the miracle morning. The 30-Day Miracle Habit Mastery Strategy, which you'll need to keep before you to stay committed to making real change in your life. The Level 10 Life information comes to you as part of the 30-Day Life Transformation Challenge. This is a downloadable packet of materials that you can use to assess your life in different areas and set goals to move toward your best life—a Level 10 Life. The only turnoff in reading The Miracle Morning is that Hal is a born salesman and does what felt like a lot of marketing. "Go here and get this!" I will admit that it bothered me less when I went back to reread, however. Also, I was really anxious to get to the meat of the material, so I was frustrated by any side trips in the reading. Frankly, I feel that frustration with most self-help books. Don't you just hate it when you have to read through a personal story before you get to the real information? I recommend that you read The Miracle Morning for yourself. It's a quick read and has some good, motivating ideas. 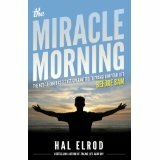 You can check out Hal Elrod at MiracleMorning.com, www.MyTMMCommunity.com, and on You Tube. I will be excited to hear what you think about The Miracle Morning.